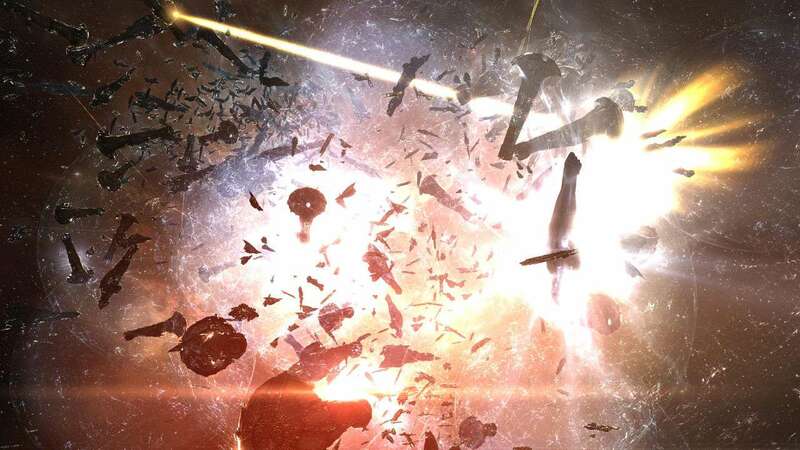 I dare say that most people first become aware of EVE when they happen upon a story about the wars and battles of nullsec powers. The gigantic fleet fights which happen between coalitions are a collection of superlatives that even attracts the attention of mainstream media. People who already play EVE are also captivated by those events. The “I was there!” meme is often used as a joke, but there is a kernel of truth in it. No matter how small your contribution, it feels great to look at the many blogposts, articles and forum threads, knowing that you were part of it. Especially if you were on the winning side. Members of significant nullsec powers become recognized people among the player community. They are invited to podcasts as valued guests. They are interviewed for articles on EVE news sites and blogs. Some get to be on stage at Fanfest Alliance Panel or player hosted presentations. The most prominent are even featured in the wider gaming press and general news media. That coverage creates great expectations for outsiders, but they don’t have to imagine themselves as future celebrity FCs, great leaders or influential directors to develop a sense of importance based on affiliation. This process works similarly to the way supporters of sports teams include themselves when they talk about the team. They will make statements like “we have won the championship” or “we reached the highest goal score this season”. It is fame and achievement by proxy. The individual feels that they are part of something greater to which they themselves contribute in a limited manner. Because of the way CCP presents EVE, there is a even sense of collective entitlement. After all, without the massive powerblocs there would be no record-breaking wars and fleet battles which can be used as a marketing pitch by CCP. Nullsec blocs are content creators who contribute significantly to the game’s unique appeal. Add all those factors to the many times you hear or read that nullsec is the endgame of EVE; how much ISK you can make out there; how well-organized the major alliances are. Indeed, it sounds great. Your actions will mean something in the game. You will be rich, significant and taken care of. You might even become famous in EVE. At the very least, you will be the proud member of a famous group. The members of the actual nullsec powerplayers have more status in-game, but they are also subject to a lot of rules. Individual players are placed in a metagaming straightjacket of diplomatic agreements, assigned ratting space , blue lists, peer pressure, mandatory CTAs, killboard efficiency, fleet participation metrics, forum participation requirements and more. The specific rules differ from one alliance to the next, but they all have them. Not living up to the rules has consequences. Those can range from public mockery and verbal abuse to expulsion with possible loss of assets. 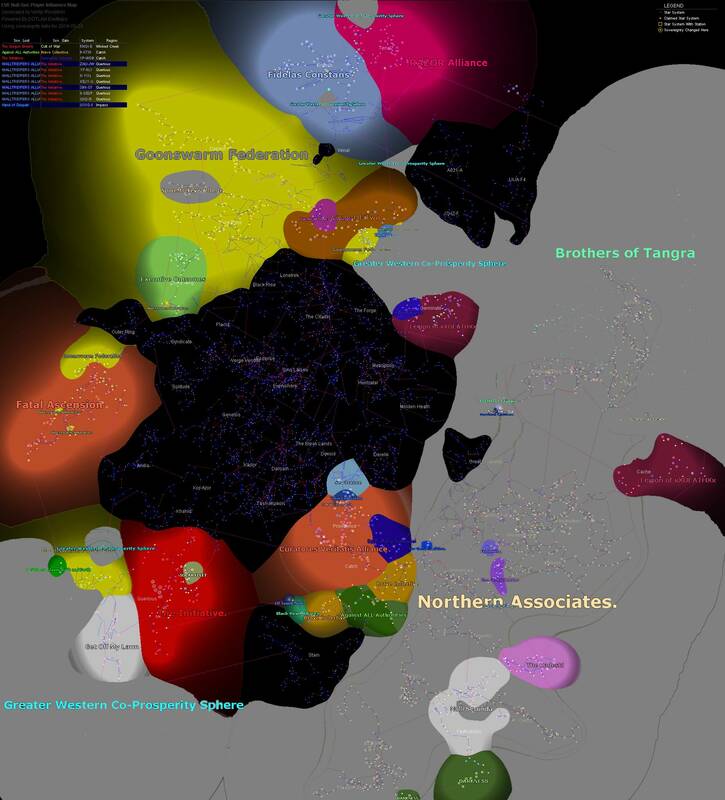 Of course, alliances and corporations elsewhere in EVE also have their regulations, but no other area is dictated by metagaming sociopolitics to the same degree as sov-nullsec. The major alliances of sov-nullsec are defined by their own narratives. That creates a strong social immersion and cohesion. Individuals consequently develop a highly defensive attitude. A strong bonding element rallies those players whenever they are challenged individually or collectively. How often have you seen nullsec players up in arms about issues that they associate with themselves? If you are a nullsec player yourself, how often have you taken things personally that were directed at your alliance, coalition, your playstyle or another individual in your alliance? I know I have. On both questions Eventually, the many rules, the narrative and propaganda, the bunker mentality and the social immersion can create a tunnel vision in a player where they completely forget there is anything else relevant in the game outside of nullsec or even outside of their coalition. Players who are that far down the rabbit hole can even get to a point where they stop thinking like individuals. Any forum discussion involving a significant number of nullsec powerbloc posters can provide an example of that. Just count the number of times that they will repeat the party line without actually participating in the discussion with their personal opinion. The great wars and spectacular battles of media renown turn out to be everything but great in reality. Mindless structure grinding. Hours of forming fleets and waiting for deployment. Timers that force people to get up in the middle of the night. Heavy time dilation that extends fights into the next day. At the end of it all, an individual player will just be one-shot off the field by the excessive alpha-strike damage of the massed enemy fleets. No level of skill in flying a ship can save you from that. Who has more guns and who can cycle them faster while switching targets becomes the deciding factor. Apart from being a numbers game, those wars are also a game of psychological attrition. The winner will be the side which can exploit themselves long enough to push the opponent into demoralization. Players with responsibilities or a busy social life quickly fall by the wayside. People will only endure so many sleepless nights and neglect of their partner, children, friends or job before they step away from it all and stop logging in. In this way, sov warfare in EVE online these days works a lot like the trench warfare of WWI. Space is not conquered per-se. Rather than that, immense fleets face each other in a painfully slow grind at a strategic location. In the last two major wars it basically came down to one massive battle. Especially the war of CFC/RUS against N3/PL showed how much of a coin toss those battles actually are. There is no significant military tactic involved, and with such tremendous commitments no side will have the capacity to repeat a similar feat. They have to go all-in and hope to remain as the last one standing. Of course not all engagements in sov-nullsec are fought with massive fleets. There are still small to mid-range fights where individual proficiency and well designed fleet doctrines are meaningful. In that arena, it is still possible to win against larger numbers through better tactics and skill. Those are, however, not the impressive media events that people associate with sov-nullsec. Neither are those small fights significant for the larger political landscape. Ship replacement programs are universally seen as positive. It is argued that they would encourage PVP because players do not have to worry about financial losses. They can also avoid the logistical burden of having to acquire and transport ships to remote nullsec locations themselves. I, on the other hand, would argue that they inhibit development. Players are told to train for specific ships and fits which are designed by alliance theorycrafters. In-depth knowledge of fitting and creativity are not necessary and therefore not cultivated. The financial benefit leads many players into only learning how to fly the ships covered by SRP. Often they know little about the way a ship really works because they are used to flying it in large fleets under FC leadership only. That lack of proficiency is the reason why many solo-pvp players like to hunt for targets in sov-nullsec. Without competent guidance, small groups of nullsec players often think that their fleet fit will be just as effective in a completely different fighting scenario. Likewise they hardly know how to properly position themselves and maneuver during a fight. It took me a considerable amount of time to unlearn such acquired habits when I returned to the game and I am still working on it. Starting with a completely fresh character, I realized that I knew practically nothing about fitting and flying frigates for example. SRPs have another insidious effect. They take away the significant game aspect that losses mean something. Because the consequences of loss are no longer felt, a power creep can be observed in sov-nullsec. Ever more powerful and more expensive doctrines are developed and covered by SRPs. That is yet another factor which makes the participation of newcomers more difficult. Without renters, moon mining and all the other large income streams nobody can match the throwaway doctrines of expensive ships which major alliances can field and replace. It has to be mentioned that not all alliances field doctrines of faction battleships or T3 cruisers, but those who do not, have fleet numbers – and losses – of such size that the end result under the bottom line remains the same. The part of an SRP which is financed through income from renters also perpetuates the problem of the renter/landlord relationship. Because the renters have to make ISK to live in their space, they will have less time for PVP activities. That keeps them in their position as inexperienced fighters who can not pull their own weight. On the other side of the equation, the landlord alliances will have to dedicate forces to defend the renters, which in turn means more need for SRPs. Alternatively they can make political deals to keep the renters out of the firing line. Both options lead further down the path to stasis. I would like to state clearly, that none of the issues I touched upon are the result of a conspiracy by the leaders of nullsec cartels. There is no brainwashing going on that turns people into “F1 Drones”. All the problems are consequences of well studied social dynamics, the sovereignty mechanics and how CCP markets the game. Still, together those influences have created an environment in sov-nullsec which can have negative effects on the enjoyment of the game. Whenever sov-nullsec players sit down to reflect, many will confirm that. In some extreme cases that playstyle can even affect people’s lives. Anecdotes of players ending up with prolonged sleep deprivation, self-neglect, even problems with a job, study or relationship are luckily not too common. During my time in nullsec I have encountered such cases, though. So far I have not heard similar stories from other areas of the game. That is not to say they do not exist. Gaming addiction is a universal phenomenon, of course, but I would venture to say that the highly engrossing environment of sov-nullsec is particularly dangerous for people who are most at risk. In conclusion I would not recommend sov-nullsec to any new player coming to EVE. Not before all the negative aspects I have discussed here are gone from the game one way or other.